Medieval Frankish civilization* was destroyed by Europe's scientific, economic, social, political and philosophical awakening. Romanity, however, was not only unharmed, but was actually reinforced by this awakening of Europe, and later of America and Russia. Whereas a Roman can distinguish between the scientific progress of Europeans, Americans and Russians from their religion and their atheism, and willingly emulate their scientific progress only, a Greekling will emulate them in everything. The reason for this is because a Greekling confuses the foreigners' scientific progress with their religious or atheistic convictions, and regards them as peoples that are "progressive" in everything. 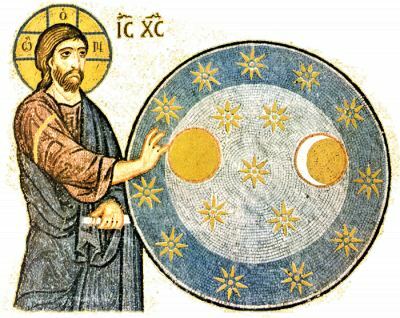 Albeit a Roman cannot fathom the historical and scientific explanation of his sentiments, nevertheless, he can clearly distinguish between religion and scientific progress and is personally sure that he is in possession of the religious truth - even though he is learning the truth of positive sciences from people of other religions (who however do not possess the religious truth). A Greekling on the contrary has the conviction that whoever possesses the truths of the positive sciences also possesses the truths of religion or of atheism. As regards theology and philosophy, a Roman is a true-blue Roman while a Greekling is a true-blue Franko-Greek, given that both represent the traditions of Frankish civilization* and of Romanity, which have their roots in the Medieval era - albeit neither of them are specialists who have become familiarized with the theological and philosophical differences between the two. As noted earlier in the previous chapter, the Roman Fathers taught out of their personal experience of theosis - of theoptia (the "seeing" of God) - that there is no similarity whatsoever between God and His creations, even though all creations were created by God and are dependent on God. This means that the truth pertaining to God and the truth pertaining to the nature of the universe do not relate to each other, although one of them is dependent on the other. One who has "seen" God knows God. A philosopher or a scientist examines created things. Neither the philosopher nor the scientist can have the knowledge of God that a prophet, an apostle or a saint with "theoptia" has, given that God does not resemble any of the things that they examine through their scientific or philosophical imaginings. On the contrary, one who has theopty can be - or become - a scientist, but not through theopty; he will know how to prepare people for theopty. The scientist will know how to teach his scientific method to his students; the one who has theoptia may become acquainted with the method of researching natural phenomena, but not through theoptia - rather only through the scientist. Likewise, a scientist can attain theopty, but not through his science - rather only through the one who has attained theopty. The one who has theopty can be literate or illiterate in matters that pertain to the world; a scientist can be literate or illiterate in matters that pertain to God. The one who has attained theopty is divinely inspired, and speaks of God without delusion, and leads others towards God unerringly, but he is not infallible in matters pertaining to the positive or other sciences - matters that he can only know as much as his contemporary scientists know. A scientist however may confuse his findings that pertain to the nature of the world with his views on God and utter irresponsible things; but this is nothing more than his philosophizing, inasmuch as he has veered away from his scientific methodology. Similarly, a "theologian" can assert scientific nonsense, but he too will only be philosophizing, inasmuch as he will have veered away from the strict theological method followed by those who have attained theoptia. The Fathers of the Church had approximately the same disregard towards philosophy - as observed nowadays in the positive sciences. It was precisely because they knew that there is no similarity whatsoever between God and the world, that they recognized as the only unerring bridge towards the knowledge of God was the Prophet, Apostle and Saint who possessed theoptia - and NEVER the imagination of a philosopher. In other words, the theology of Romanity was based entirely on the experience of theosis, or the theoptia of the deified. It is precisely in this detail that the amazing unity and uniformity can be discerned in the theology of the Fathers of Romanity. Those who have the same experience of God also have the same Theology, and they do not confuse it with the fantasies of philosophers and the knowledge that pertains to the nature of the world. Thus, Romanity is not in the least affected by contemporary scientific progress; on the contrary it is fortified, given that its steadfast historical views regarding the nonexistence of philosophical metaphysical systems have proved to be true. However, because Frankish civilization* got carried away by Augustine, it came to accept Plato as the bearer of the basic truth of Christianity. When Plato in the 13th century Frankish era succumbed to Aristotle (who had been introduced by the Arabs of Spain), Frankish theology underwent a certain readjustment in order to survive. However, with the advent of every new philosophical current, Frankish civilization* was compelled to defend itself by supporting its Aristotelian foundations. This combination of Frankish theology and Aristotle went downhill from the 14th century and it became a mockery when the Frankish theologians used Aristotle's authority to prove the findings of Copernicus (1473-1543), of Giordano Bruno (1548 - 1600), Galileo (1564 - 1642) etc. as erroneous. In fact, Bruno was condemned to death on the pyre by the Frankish church in Rome, because he dared to disagree philosophically and scientifically with Aristotle, and among other things, to agree with Copernicus that the Earth revolves around the Sun, and that the Sun does not revolve around the Earth. 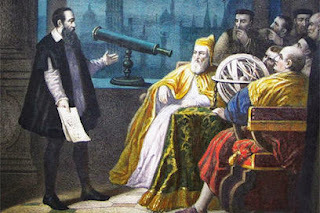 Galileo escaped a similar death penalty, because he cowered, then declared repentance and reneged on Copernicus' theories - even though he had proven them correct through the telescopes that he himself had constructed and improved. At the root of the problem regarding the relations between ecclesiastical dogma and scientific truth in Frankish civilization* was the illiterate Medieval Franks' naive identification of the truth pertaining to God to the groundless metaphysics of Plato and Aristotle and their perception of nature. In other words, they believed - like the philosophers - that the truth pertaining to natural phenomena and the truth pertaining to God are one uniform truth, so that through Nature's truths, one can be led to the truths regarding the essence of God. All the above, combined with a naive theory that God actually dictated the words of the Holy Bible in the languages that were supposedly created by Him (see, for example, Dante **), and also a mythical world theory about "Hell" and "Purgatory" existing below the surface of the earth and a "Paradise" in the sky (again, see Dante ***), they rendered Frankish civilization* a mockery in the face of the consecutive findings of the positive and historical sciences. Finally, the empirical gnosiology of the Enlightenment as well as the theory regarding the evolution of the species gave the final blows to the Latin and Protestant theology of the past, thus bringing down ignominiously the bases of the old European perceptions regarding law, ethics and truth. The tragic fact is that, those who are no longer familiar with Romanity and who also confuse Orthodoxy with the religious traditions of Europeans, have the impression that whatever applies (in favour or against) European Christianity also applies (in favour or against) Orthodoxy. This is also reinforced by the fact that the Neo-Greeks' theology (like everything else of the Neo-Greeks) is borrowed, or is taken directly from Europe or through Frank-influenced Russians. The reality is that the exact opposite is true. * Frankish civilization - When Fr.John Romanides, and modern Greeks in general, refer to "Frankish civilization", they mean the western civilization that was the outcome of the founding of Charlemagne's Frankish Empire the way that it developed, as opposed to the western Roman civilization that pre-existed it and continued in the East. He does not imply (only) the Franks, because a variety of peoples were significant parts of the Empire. As for the distinction between Romanity and Frankish civilization, it is not a geographical distinction (i.e., East - West); it is a distinction between different traditions. One can quite easily be an indigenous citizen of the West and be a carrier of Romanity and likewise, one can reside in the Orthodox East but be the bearer of the Western (Frankish) theological tradition. It is in this context that we should perceive Fr. John's terminology. ** De Vulgari Eloquentia, I, 6. See the Roman Fathers' views in Fr. Romanides' work Dogmatic and Symbolic Theology, Thessaloniki 1973, pp.168-185. *** Divina Comedia, a poetic expression of the theology of Thomas Aquinas. See: A. J. Butler and E.G. Gardner, Dante, EB, VII, 39 etc. Source: Romanity, Romania, Roumeli - a book not yet translated by Fr. John Romanides - Chapt.4:2.